Hundreds of sinkholes are forming each year around the drying Dead Sea that could face being completely parched by 2050. Its basin shrinks by a meter per year due to severe water mismanagement. “These sinkholes are a direct result of the inappropriate mismanagement of water resources in the region,” said Bromberg, who believes that the total number of sinkholes has grown to over 3,000. Just ten years ago roughly 1,000 sinkholes had been reported, according to Smithsonian magazine. The Dead Sea, actually a lake, has existed in its present form, after splitting off from a larger water mass for the past 18,000 years. But since the 1950s Israel and Jordan have diverted the flow of the Jordan River, turning a once powerful flow into a trickle, full of sediment. As a result, the Dead Sea is 800 million cubic meters short of water each year, and its level has fallen for 40 meters. As it recedes, it leaves behind salty deposits. While initially, these are firm, over the following years, the salt is dissolved, by rain, groundwater and river flows, creating a cavity underneath the ground. These cavities can collapse any time, creating a deadly sinkholes. Several sinkholes can merge together, producing giant, gaping craters. While no official statistics are kept about the deaths and injuries caused by them, there are hundreds of warning signs dotted around the edge of the water. Last month Jordan and Israel signed a ground-breaking $900 million deal that will see a desalination plant built on the edge of the see, which will have water pumped into it via a canal from the Red Sea. 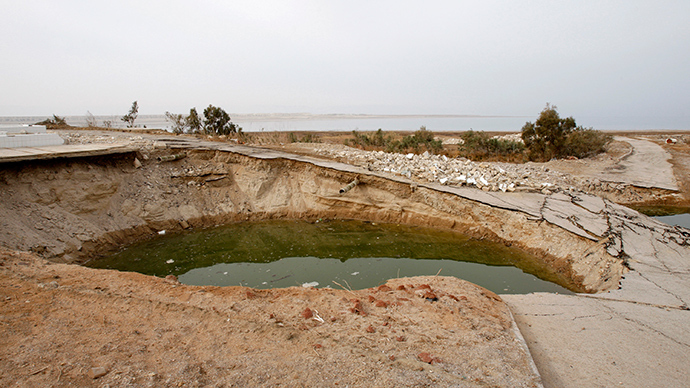 Unfortunately, the costly project, approved by the World Bank is unlikely to significantly curb the deterioration, as it will only pump 100 million cubic meters of wastewater into the Dead Sea.